. . . St. Louis Federal Reserve President James Bullard told Bloomberg TV he thought the Fed should consider making U.S. banks pay money to park cash, too. He’s been saying this for more than a year, but the idea is slowly gaining more credence. But even that might not be enough: Some economists think interest rates should be much, much lower than zero: Maybe negative four percent, before adjusting for inflation. Summers recently warned that the U.S. and other big economies could be in a near-permanent state of malaise — like Japan since the 1990s — because interest rates are still too high even at zero. Many liberal economists, including Paul Krugman, think sharply negative interest rates could be the only way to deal with this. There may be some loud noise emanating from the banks and Wall Street but since congress is stuck on the austerity train wreck, this could be a way for the Federal Reserve to kick start some stimulus. With Summers behind it, it just might be the last desperate solution. The progressive Democrats of the Senate got Larry Summers to withdraw from consideration for chair of the Federal Reserve over the weekend. So now they’re yellin’ for Yellen. Well, folks Janet Yellen the current vice chair of the Federal Reserve is just the distaff version of Larry minus the misogyny. Huffington Post‘s senior political economy reporter Zach Carter gives a rundown of Ms. Yellen’s policy history before and during her tenure as chair of Council of Economic Advisers in the Clinton administration. During that time she backed the repeal of the landmark Glass-Steagall bank reform, supported the 1993 North American Free Trade Agreement and pressured the government to develop a new statistical metric intended to lower payments to senior citizens on Social Security. Yes, dears, that last one would be an earlier version of the Chained CPI. Before Yellen joined the Clinton administration, she was a respected economist at the University of California at Berkeley. In 1993, she joined dozens of other academics in signing a letter to Clinton advocating for the North American Free Trade Agreement. The letter was signed by prominent conservative economists including Milton Friedman, but also by many economists who are now considered progressive, including Paul Krugman and former Obama adviser Christina Romer. Krugman has since expressed disappointment with some of the trade pact’s effects. The full transcript of Ms. Yellen’s Feb. 5, 1997 conformation hearing can be read here (pdf). Another point here is that Glass-Steagall really wasn’t behind the crisis. Wonkblog’s Glass-Steagall explainer has much more detail on this, but perhaps the simplest way to make the point is to quote Sen. Elizabeth Warren, the lead sponsor behind the bill to restore Glass-Steagall. When Andrew Ross Sorkin asked her whether the law would’ve prevented the financial crisis or JP Morgan’s subsequent losses, she said, “the answer is probably ‘No’ to both.” There are good reasons to bring back Glass-Steagall, but they’re separate from the events of 2007 and 2008. Which is only to say that supporting the repeal of Glass-Steagall in 1997 doesn’t say that much about somebody’s opinions on regulating Wall Street today. And, in general, we don’t know very much about Janet Yellen’s views on the subject. As I’ve argued before, the support for her on this dimension (as opposed to on the monetary policy dimension) really comes from an anybody-but-Summers impulse. Carter also noted in his article that Ms. Yellen is more consumer friendly. During her tenure as president of the San Francisco Federal Reserve from June 14, 2004 until 2010, she identified the housing bubble and urged stronger regulation to limit its damage. “Be careful what you wish for; you might get it” was made for situations like this. So let’s not confuse a solid base hit with a game-winning grand slam, OK? A long time ago, after an incident that had left me particularly furious with a disagreeable colleague, a friend told me to be patient eventually this person would fall on his own petard. After all, it wasn’t the short term paybacks that one needs to worry about, its the long term paybacks that get them in the end. And so it was, some years later, my nemesis got too arrogant, made some foolhardy decisions and was forced to retire in disgrace. I had long since moved on another path that was ultimately more satisfying but when I heard the story of his fall I had to wryly smile. 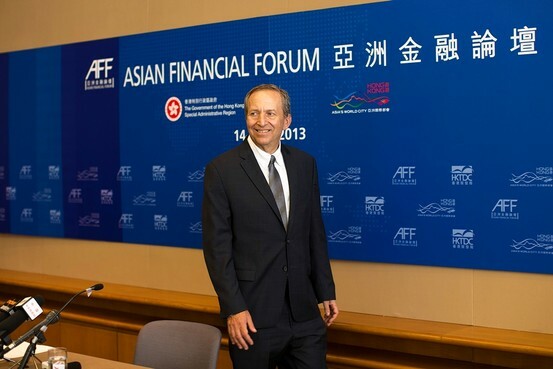 Over the weekend, after some weeks of speculation about who would succeed Ben Bernanke as chair of the Federal Reserve, President Barack Obama’s rumored favorite, his former chief economics adviser, Larry Summers, withdrew his name from consideration. Mr. Summers had come under fire from the progressive left for his Chicago School economic policies and his past history as President Bill Clinton’s Treasury Secretary. It was during Summer tenure as Treasury head that Glass-Steagal was repealed leading to the current economic mess. Add to that his misogynistic attitude and the rise of one of the women to whom he was so dismissive and you have the recipe for the down fall of one of the most “dickish” (Charlie Pierce’s term) personalities in government. Summers had also opposed naming Warren to permanently head the Consumer Financial Protection Bureau, a decision that came back to haunt him, as Warren instead ran for the Senate and won a spot on the Banking Committee, where she has now helped tank Summers’ shot at the Fed chairmanship. The fact is that Senator Professor Warren was one of the driving forces behind a genuine populist uprising of liberal Democratic senators — and Jon Tester, too — and that uprising has kicked Larry Summers to the curb. She has quietly carved out a leadership role in the one area in which she is an acknowledged expert. (What she will do if it ever comes to a vote on making war in Syria is anybody’s guess.) Quite simply, she is doing what she said she would do when she was running for the Senate. She has enough allies to get done a lot of what she wants to get done. Anything this president — or his successor — wants to do as far as national economic policy now has to go through her, and through the coalition to which she belongs. I still don’t think the president will nominate Janet Yellin — He’s got his back up about it now — but whoever he does nominate is going to have to have a chat with the nice professor in the glasses who’s got just a few questions she’d like to ask. I’m sure there are a lot of women, from Brooksley Born to Christina Romer, wryly smiling. Long term paybacks can be very satisfying. It would be, however, a serious mistake to suppose that our only problems are cyclical or amenable to macroeconomic solutions. Just as evolution from an agricultural to an industrial economy had far reaching implications for society, so too will the evolution from an industrial to a knowledge economy. Witness structural trends that predate the Great Recession and will be with us long after recovery is achieved: The most important of these is the strong shift in the market reward for a small minority of persons, relative to the rewards available to everyone else. In the United States, according to a recent CBO study, the incomes of the top 1 percent of the population have, after adjusting for inflation, risen by 275 percent from 1979 to 2007. At the same time, incomes for the middle class (in the study, the middle 60 percent of the income scale) grew by only 40 percent. Even this dismal figure overstates the fortunes of typical Americans; the number unable to find work or who have abandoned the job search has risen. In 1965, only 1 in 20 men between ages 25 and 54 was not working. By the end of this decade it will likely be 1 in 6-even if a full cyclical recovery is achieved. While working with Partners in Health in Lima, Peru, in the mid-1990s, Dr. Kim helped to develop a treatment program for multidrug-resistant tuberculosis, the first large-scale treatment of that disease in a poor country. Treatment programs for multidrug-resistant tuberculosis are now in place in more than 40 nations, according to Dr. Kim’s biography on Dartmouth’s Web site. He Kim also spearheaded the successful effort to reduce the price of the drugs used to treat this form of tuberculosis. The United States traditionally selects the head of the World Bank and Europe the leader of its sister institution, the International Monetary Fund, since they were founded during World War II. Angola, South Africa and Nigeria put forward Ngozi Okonjo-Iweala, the Nigerian finance minister and former World Bank official. José Antonio Ocampo, the former finance minister of Colombia and a United Nations official, is rumored to be another candidate. Jeffrey Sachs, the development economist and director of the Earth Institute at Columbia University, has put himself forward for the position. If there are more than three candidates, the board will announce a “short list” and the new head will be named in time for the April meeting of the World Bank and the International Monetary Fund. Dr. Kim is an excellent choice with experience in global development and management. He is well known and well liked. We wish him luck. If there could possibly be a worse choice to head the World Bank when Robert Zoellick’s term expires later this year, I am sure that President Obama would find him or her. The rumors are that the president has decided to leave his “mark” on that banking institution by nominating Larry Summers for the position. Yes, that Larry Summers of the Harvard president of misogyny fame who was chief architect of banking deregulation that led to the repeal of Glass – Stiegel during the Clinton, that begat our current financial crisis. The Larry Summers who dismissed out of hand the suggestion that a bigger stimulus package would do more to boost the economy most likely because it was a woman, Christine Roemer, who proposed it. The only way to be an effective World Bank president is to be an effective diplomat. Like all CEOs, the head of the Bank reports to a board of directors – but at the World Bank, the board of directors meets twice a week. And they’re not friendly hand-picked board members, either – they’re political appointees who fight their geographical corners, who live full-time in Washington, and who work full-time out of offices within the Bank itself. If you want to get anything done at the Bank, you need to persuade the board to leave you alone and not micromanage every decision you make. And then there’s leadership: “the vision thing”, as Geoge HW Bush would put it, and the ability to get your organization to line up behind how you think the Bank – and, for that matter, the World – should work. Summers is not known for his work on global poverty reduction, and his previous tenure at the World Bank is remembered mainly for the pollution memo – an “ironic” proposal to increase pollution in poor countries, which resulted in the label “perfectly logical but totally insane” being attached to Summers for many years thereafter. If Obama wants to leave his mark on the World Bank, this will definitely do it but not the way he’d like. It’s no wonder that there is now so much irrepressible enthusiasm among the liberals and independents and progressives who tipped the balance in the democrats favor in 2006 and in 2008 to get out and vote for democrats in the 2010 midterm elections.